Given that Carlos Reutemann went on to serve as governor of the Argentine state of Santa Fe, it should come as little surprise that his Formula 1 career was defined by politics. Today, his name is immediately associated with a bitter fight with Williams team-mate Alan Jones during the 1981 season - a fallout that began when Reutemann ignored team orders in Brazil, and ended with Jones refusing to lend Reutemann his support in the title-deciding final race at Las Vegas, where Reutemann fell to Nelson Piquet by a single point. Bad blood between he and the team prompted him to quit F1 just two rounds into the following season. 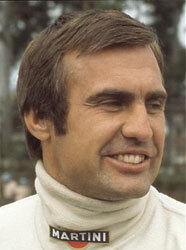 Should Carlos Reutemann be higher or lower in F1's greatest drivers?